Sometimes, you just gotta let the thing speak for itself: “Miri and Luey have a dilemma. Their dad’s been turned into a cat and their closet is a garden full of goblins. 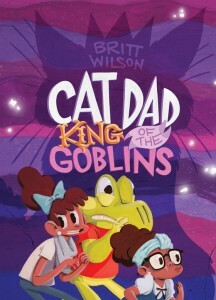 There is only one thing for them to do — grab their friend Phil the frog and dive headfirst into a wild, woolly and wacky adventure.” Cat Dad, King of the Goblins was written and illustrated by Canadian artist Britt Wilson. This full-color short graphic novel is available now from Koyama Press. Check out the preview over at Publishers Weekly.